SHE used to walk past my little villa in Saigon, not far from the American embassy, her conical straw hat on the back of her head, white pajamas flapping as she loped down the street, soup makings dangling from the wooden yoke across her frail shoulders. She came early every morning, repeating the monosyllable with an inimitable inflection. "Pho," she called, her voice gentle and plaintive. "Pho." That was 35 years ago, and I took it for granted that the delectable, aromatic noodle soup she sold, crowned with a lush tangle of green herbs, had originated many generations ago in the fertile Mekong Delta. Wrong on both counts, as I discovered when I finally returned not long ago to this ancient land that struggled so fiercely for freedom. Pho was developed by cooks in Hanoi, not in the south, and not until after the French arrived late in the 19th century, importing their love of beef to a pork-eating culture. The name might have given me a clue. 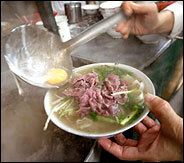 "Pho" is pronounced almost exactly like "feu," the French word for fire, as in pot-au-feu. Did Vietnamese cooks learn its secrets while toiling in the kitchens of colonial masters? Some think so; others think it evolved from Chinese models, like the Vietnamese language and the people themselves. Today it is a national passion, beloved across the country in hamlets as in cities. It is almost as widely available in the United States, where few big cities lack a pho shop, and some, like Washington, have dozens. In Hanoi, pho is a cult. It is served in alleyways and on street corners all over town, usually on low plastic tables, surrounded by even lower plastic stools, only about 12 inches high, that always make me feel like a circus elephant trying to balance on a ball. These are set on the sidewalk, in the gutter and even in the roadway; the Vietnamese give special meaning to the phrase "street food." Here the soothing broth is paler than in the United States or in Ho Chi Minh City (Saigon's official name, HCMC for short). The rice noodles are more delicately translucent, and fewer embellishments are added than in the more indulgent south. The result is light and thrillingly restorative. On a good day, I think I could eat three bowls and leave under my own power. My wife, Betsey, and I stopped in at Mai Anh, one of a string of open-air pho shops on Le Van Huu Street, which runs along the southern edge of Hanoi's bustling French Quarter. Stock made by simmering oxtails and marrow bones for 24 hours, along with onions, star anise, ginger and cinnamon bark, was bubbling away in a cauldron perched on a charcoal stove. Bowls of various meats cooked chicken, giblets, paper-thin raw sirloin, pig hearts awaited our inspection. We chose beef. If you choose chicken, you will be eating pho ga; if you choose beef, you will be eating pho bo. I don't imagine for a minute that you'll choose pig hearts. The pho-meister dunks a sieve full of flat, precooked noodles into a pot of boiling water (so they do not cool the soup), drains them and slides them into a bowl. Thinly sliced onions and chopped coriander leaves go in next, along with shavings of ginger. Then the blood-red beef, and last a few ladles of hot stock, which cooks the meat in a few seconds while giving off a fragrant, enveloping cloud of steam. On the table are spring onions, red chili sauce and vinegar with garlic slices to enrich your meal-in-a-bowl, plus several lime wedges. A southerner would feel deprived without some bean sprouts, and without a plate heaped high with herbs rau que, or Asian basil; earthy ngo gai, or sawleaf herb; and once in a great while rau ram, or Vietnamese coriander. But the northerners are ascetics compared with their southern cousins. Still influenced by the puritanical Confucianism of their Chinese neighbors, they prefer their flavors pure, unadorned and crystal-clear. As you will find when you dig in chopsticks in one hand, plastic spoon in the other no sacrifice of heartiness or complexity is entailed. Mix and slurp, sniff and gulp to your heart's content, for less than $1. For some reason the snarl of the motorbikes as they stream past, all but nipping at your ankles, is no distraction. Maybe because it's so much fun to watch your fellow eaters, especially if some are novices. We saw an eager if inept German woman get through her soup by coiling her noodles around her chopsticks with her free hand. THE Vietnamese wax poetic about pho, assigning it a central and unifying place in their culture. Duong Thu Huong, a novelist, rhapsodized about walking the streets, inhaling the soup's subtle perfume as it rises from the stockpots. Huu Ngoc, a social historian, sees it as a symbol of the national fight for self-determination: even in the darkest times, when the wars against the French and Americans were going badly, the Vietnamese were always free to express themselves by making and eating pho, their own culinary creation. "It was complete, nutritious, infinitely delicious and yet so easy to digest," he recalled a few years ago, "that we could eat it morning and night, day after day." And so the northerners do, looking down upon the southerners, who eat their pho mainly at breakfast and occasionally at lunch. For the Vietnamese, even those who left the country long ago, pho tends to stir memories, the way a madeleine did for Proust. I, too, was ambushed by the past. A bowl of bun bo Hue, the imperial capital's spicier version of pho, made with round noodles, beef, pork, lemon grass and whole chilies, carried me back to the turbulent days of the Buddhist uprising of 1966, when John D. Negroponte, now the United States representative at the United Nations, was in charge of the American consulate in Hue, on the very street where I was eating. Our friend Mai Pham, who was born in Saigon, runs a hugely successful Vietnamese restaurant, Lemon Grass, in Sacramento. She also writes cookbooks, most recently "Pleasures of the Vietnamese Table"
(HarperCollins, 2001), and she has developed a refrigerated pho stock base, marketed to restaurants and institutions by StockPot, a subsidiary of the Campbell Soup Company. Why, I asked her recently, does pho fascinate you so much? "It's so beefy!" she exclaimed with a smile and without hesitation. "For me, it's the ultimate comfort food. You smell the soup's perfume, and it's so beefy!" Her husband, Greg Drescher, director of education at the Napa Valley campus of the Culinary Institute of America, chimed in. Perhaps for the Vietnamese, for most of whom beef remains a great luxury, he said, but not for Americans, for whom it is one of life's commonplaces. What attracts me is the hypnotic mixture of flavors in the broth, especially those imparted by spices like star anise and ginger. Preliminary charring of the onions and ginger adds a smoky undertone. In the south, the mingling of sweet, sour and salty tastes is further augmented by a few dashes of nuoc mam, the fermented fish sauce that plays the same role in Vietnam that soy plays in much of Asia. The clearest and most pungent comes from Phu Quoc island, off the south coast. No one has ever accused me of being a minimalist; when I'm lucky enough to land within range of an In-N-Out burger joint, for example, I order my double double with the works. So it's no surprise that I load up my pho with a couple of squeezes of lime juice, a scattering of bean sprouts (if they're sufficiently crunchy), a disk or two of hot green chili and a variety of herb leaves, pulled carefully from their stems. That's the Saigon style: a bowl of soup and a salad, all in one. SAIGON, or HCMC, to be proper about it, has a range of soup shops, from tiny ones in the Hanoi style to a few pho factories like Pho 2000, near the Ben Thanh market, which Bill Clinton put on the map by eating there. Occasionally, a gifted, energetic cook will make pho at home a major task, given the time needed to make the broth and one of the best bowls we ate was served to us at home by Nguyen Huu Hoang Trang, a veteran of restaurant kitchens. So fine was her touch that every one of the key ingredients, from cinnamon to anise to ginger to onions, was individually discernible in the perfumed steam that rose from the soup, and in the flavor, too. You could miss my favorite breakfast place in downtown Saigon if you got there at the wrong time of day, which is anytime after about 11 in the morning. There is no sign, and most of the furnishings disappear after the close of business. Run by a tiny, wizened man whom people call Chu Sau, which means Sixth Uncle, it consists of a few battered Formica tables in a gloomy alley covered with a corrugated tin roof, plus several of those diabolically low tables and chairs, murder for my aging knees, on the sidewalk. The address is 39 Mac Thi Buoi, two long blocks from the Caravelle Hotel, toward the river. Chu Sau's limpid pho comes with a bowl of notably crisp mung bean sprouts, hoisin sauce (best avoided, I think, because it muddies the soup's flavor) and an unusually bright orange chili sauce, as well as Asian basil and fuzzy-leafed mint. What set it apart, for me, was the mellowness of the amber-hued broth, in which the taste of cinnamon was pronounced. It glittered in the mouth, the way homemade bouillon does and beef stock made from a cube doesn't. The noodles were perfectly al dente, if you will permit a solecism, and I enjoyed them so much that I didn't even give myself a demerit when I splashed chili sauce all over my white polo shirt. Pho Dau, located in a courtyard off Nam Ky Khoi Nghia Boulevard, which leads to the airport, is an entirely different kettle of soup. During the war, it was a hangout for South Vietnamese generals; now it is a haunt of the new, privileged capitalists, whose Mercedes S.U.V. 's and $6,000 Honda motorbikes are parked out front. Bits of beef cartilage and tendon enrich its broth, as do quantities of coriander. With our pho, we drank glasses of fabulously smooth ca phe sua da, which is Vietnamese filter coffee, served iced with condensed milk. As we watched the well-dressed customers eating pho for breakfast, we talked about how odd soup seems to us Americans as a daily curtain-raiser. But it isn't that strange, really: the Japanese eat miso; the Chinese eat congee, a soupy porridge; the French (particularly Parisians) eat onion soup after a night on the town; and the Hungarians eat sauerkraut-and-sausage soup to ease a hangover. Pho Hoa, an open-front restaurant on Pasteur Street, is less grubby and more cosmopolitan than most noodle shops, with comfortable tables and chairs. I learned some more lessons there, even though it came late on our soup schedule. Lesson 1: the richness that characterizes well-made pho broth comes not from fat, which must be skimmed from the broth, but from marrow. Lesson 2: you can order not only rare beef (tai) in your pho, but also well-done beef (chin) and fatty beef (gau). My teachers were the affable gent at the next table, Lam-Hoang Nguyen, a visiting Vietnamese restaurateur from Thunder Bay, Ontario, on Lake Superior, and his wife, Kim-Ha Lai. "When we come back," he confided after a while, "we always go right into the street. The street is where you find the quality in Saigon not in hotels." THAT'S good advice, not only in HCMC, and not only when you want a bowl of pho. 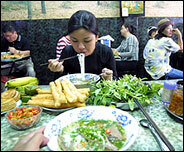 Vietnam is full of quick, fresh, readily available nibbles, and many people eat four or five mini-meals every day. In the main Saigon market, Ben Thanh, where you can buy a suitcase, look live snakes in the eye, shop for spices and snack the day away, we discovered bun thit nuong an irresistible combination of vermicelli threads tossed in scallion oil, topped with lettuce, strips of barbecued pork, cucumber and carrot slices and peanuts, and dressed with nuoc cham, a luscious sauce made from nuoc mam diluted with water, sugar, lime juice and chilies. Sweet and tart, bland and spicy, soft and crunchy, ample but light, it made a luscious hot-weather lunch early one afternoon. No wonder Mr. Drescher always makes a point of heading for the market to eat bun thit as soon as he steps off the plane from California. One evening at Anh Thi, one of several Saigon crepe shops in narrow Dinh Cong Trang Street, we watched orange tongues of flame dart from underneath charcoal braziers to lick at the dusk. The crepes are called banh xeo, the word "xeo" an onomatopoeic rendering of the sound of batter hitting the pan. The cooks sit on low benches in front of batteries of braziers topped with 12-inch pans; they control the speed of cooking by shifting pans from one fire to another. The crepes are yet another example of the Vietnamese genius for combining inexpensive ingredients to produce lively but never overpowering tastes and intriguing textures. In this case the secrets are a light, bright crepe batter made with rice powder, coconut milk, local curry powder and turmeric; a filling of shrimp, bean sprouts and unsmoked bacon; and, as is so often the case here, a wrap and a dip. You tear off a piece of crepe, wrap it in a mustard-green leaf with an aroma so sharp that it made me sneeze, add a chili and some mint, and dip the whole package in peppery, faintly sweet, faintly fishy nuoc cham. The special crepe, with an extra-large portion of shrimp, cost all of $1.35. "Delicious, nutritious and cheap," Betsey said. "I think that's a pretty tough combination to beat." At Lac Thien in Hue, whose proprietors are deaf-mutes, we sampled the local version of crepes, known as banh khoai, or "happy pancakes," served at steel-topped tables. These are smaller, about six inches in diameter, sweeter and eggier. They are served not with mustard greens but with coriander and mint, and not with nuoc cham but with a fermented soybean sauce. Cha Ca La Vong in Hanoi, owned by the same family for generations, serves stunning freshwater fish, cubed and braised with turmeric. Dill, spring onions, peanuts and chilies are at hand to enliven flavor. Splendid stuff. But except for pho, no street food we ate could touch the phenomenal fare at Bun Cha Hang Manh in Hanoi's Old Quarter, a four-story warren of tiny rooms and cracked floors. Crouching women cook everything on tiny propane stoves in the open-air entrance hall. "Everything" consists of two items, both of which are the best of their kind available, in Hanoi or anywhere else, for that matter. One of them is bun cha, Vietnam's apotheosis of the pig. It consists of charcoal-grilled strips of belly pork and pork patties the size of a silver dollar. These arrive at a table laden with a plate of rice noodles, a plate of red and green lettuce and herbs of every description, a little bowl of finely chopped young garlic and a bigger bowl of nuoc cham, with slices of tenderizing papaya bobbing gaily in it. For hotheads, there are incendiary bird chilies. Hang Manh's second dish is spring rolls (nem ran in the north and cha gio in the south) great fat ones, as thick as your thumb, packed with crab, ground pork, wood-ear mushrooms, onions and bean threads. I noticed right away that the frying oil was changed every few minutes, and of course the rolls emerged from it crackling, light and greaseless. "These rolls make the rest of what we've had here taste like so many Rice Krispies," Betsey announced. We went twice, at 11:30 a.m. both times, to avoid the throngs that pack this humble restaurant, while ignoring others serving similar specialties. We ate until we could eat no more. I wonder: can there be any better $3 lunch for two, anywhere in the world?